Fort Walton was just named the 10th happiest city in America and we know why - We have the best beaches, restaurants, and activities. We welcome you to stay at Azure, a Mediterranean style condo, on one of the most beautiful white beaches in the world, where the water glimmers in a jewel emerald color. This 1223 square foot condo, 3 bedroom- 2 bath, is professionally decorated. You can relax, build sand castles, and build lasting memories. Your beach rental includes FREE beach service (2 beach chairs and an umbrella set up for you daily); updated appliances and flat screen TVs in every room. We will help make your vacation affordable and fun by suggesting near-by attractions and coupons. Our condo comes equipped with wireless internet access; espresso machine, crockpot, rice cooker, fishing poles, boogie boards, additional beach chairs, and sandbuckets so your vacation planning is easy. Lounge on the beach or on the oversized corner balcony with the best side views of the beach and the bay. Ft. Walton beach continues to be one of the most beautiful white beaches in the world, and the water glimmers in a jewel emerald color. This beach stands apart in beauty with the sugar white sand and the grandeur of the azure gulf. You will enjoy restful waves, dolphins, jacuzzi, and the heated pool. We welcome you to your home-away-from-home where you can create a lifetime of memories. Guests have enjoyed a worry-free, vacation where they are treated like family. Please view our positive guest comments from guests who keep coming back. Get the best side view of the beach waves and boats on the bay. My family and friends enjoy watching the dazzling firework shows off the bay while lounging on the oversized, private, covered patio. We like dining on fresh fish caught off the pier or caught deep sea fishing. Our children have fun in the bunk-bed room with the comfy, beanbag chairs and flat screen TV with a DVD player. This 1223 Square foot condo is professionally decorated and includes a St. Cecilia granite kitchen countertops with top-of-the-line stainless steel kitchen appliances. The kitchen is fully stocked with dishes, and a variety of pots and pans and even a crockpot for cooking. Both bathrooms are spacious and beautifully decorated with granite counters and the master room includes a jacuzzi tub to jet away any stress. For your movie viewing, we provide flat screen TVs in every bedroom with a DVD player and a complimentary movie library. Two private pools each with a hot tub. One pool is heated seasonally. The mushroom fountain and spray park that connects the 2 large, spacious pools adds an additional fun dimension for kids of all ages. Beach buckets are ready for you to walk-onto the beach to build that special sandcastle - one of our favorite beach traditions! We have also included fishing poles for your use and boogie boards to catch the perfect wave! If you need to combine work with pleasure, you can easily access your email or surf the web with our complimentary Wireless Internet Access. Indulge in the gourmet restaurants just minutes from the condo, then work off those decadent desserts with long walks on the beach or in the state-of-the-art fitness room provided. We know the last thing you want to think about is laundry, however we have provided a washer/dryer for you to easily toss in those dirty clothes so you can pack light. We want you to leave your worries behind and relax in our clean condo with all the extras to make your vacation memorable. The unique and new Mediterranean architectural style of Azure has made it the number one location on Okaloosa Island. 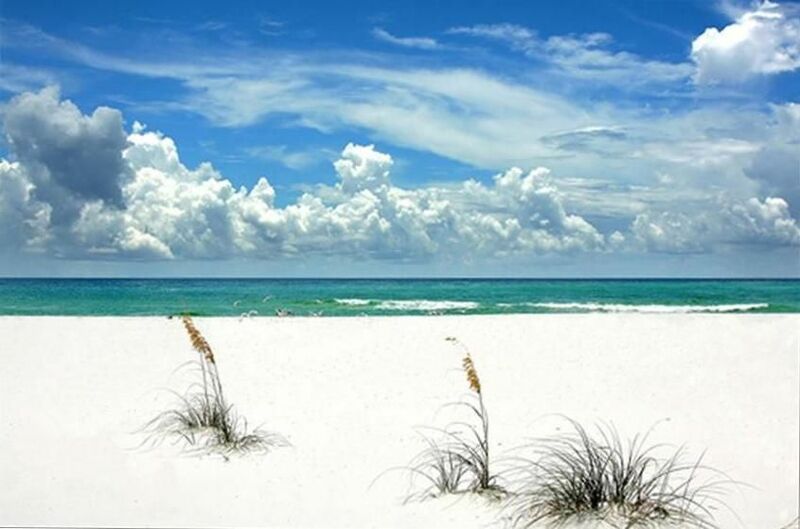 Fort Walton/Destin has the whitest beaches and the most beautiful emerald ocean. Our Azure condo is one of the newest and most elegant on the island. Our favorite activity is building sandcastles with our children and taking long walks on the beach to find special seashells. We also enjoy fishing off the pier. We like reading the books from our library which inspires our mind while resting in the lounge chairs. The Outlet Malls provide us with a lot of bargain shopping and the restaurants are so plentiful and every meal is delicious. One favorite restaurant is 'Harry Ts'. Side unit with view of the beach. Side unit on the beach. Walk right onto the sugar sand beaches. Great side view of the sugar white sands & emerald waters. Enjoy free internet service to chat with friends or check in on important business information. Kitchen contains the latest sleek stainless steel appliances, including an espresso machine, crockpot, rice cooker, coffee machine, and rolling cooler for poolside picnics. Large balcony overlooking the bay and coast. Rent boats only 5 minutes away or charter a fishing trip. Espresso machine and Gourmet Coffee machine; Fishing Poles for your use on the nearby Fishing Pier; Boogie Boards; Buckets and Shovels to build that perfect sand castle; extra beach chairs and beach umbrella. We stayed for 63 nights Jan- March 2019. We left loved the condo. The King & queen beds were very comfortable. We did not use the bunk room but the beds seemed comfy. The kitchen is well stocked for cooking. The balcony is awesome! The layout of the condo works great because the guest room & master have a bath & are on opposite sides of the condo. Azure has great pools, beach & workout facility. The condo is stocked with beach toys , chairs & fishing poles. Washer & dryer work great. Great restaurants nearby. Okaloosa Island is quiet but close to Destin night life.We loved it so much we reserved it again for next winter. We stayed in Your condo in October and had the best vacation ever. Your place was just the thing We needed for a getaway trip. I just think it ended too soon. Hope to be back next year! We stayed at this condo for the first time and will definitely be back. It is beautiful, clean and well maintained. It more than met my expectations. We really enjoyed the beautiful views of the emerald waters and the bay side. It was a joy getting to know Michele and she was so helpful to me. I definitely recommend this condo for anyone. It is conveniently located to outstanding restaurants and area attractions! i can't say enough good things about this condo and you will not be disappointed! Better late than never. My hubs and I spent a week at The Day's condo. It's very comfortable. The balcony is perfect to watch everything on the beach. Michele and her family are our dear friends. They are the most wonderful welcoming family we have ever met. We consider them family. Michele is such a positive person that after you speak with her you'll have a new sense of joy. She is a bundle of joy that exudes to everyone around her. You will not go wrong renting this wonderfully appointed condo. My friends and I could not have asked for a more exceptional stay at Michele and Alan's condo! In all of my experience vacationing, I have never had better renters than Michele and Alan. They were quick to respond to all questions, either by phone or email, and were incredibly flexible! The condo itself is absolutely gorgeous, well maintained, and had all the amenities one could need. I would certainly stay at this condo again!! Thank you for the lovely review and for renting our beach condo. We invite you back anytime. You are delightful guests, and we are so honored that you stayed at our condo. We welcome you back anytime. Thank you for the incredible review!